↑ Teofilo Laime Ajacopa, Diccionario Bilingüe, Iskay simipi yuyayk'ancha, Quechua – Castellano, Castellano – Quechua. ↑ "UNESCO advisory body evaluation" (PDF). ↑ Burger, Richard L.; Salazar, Lucy C. (2004). 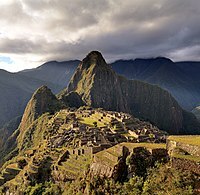 Machu Picchu: Unveiling the Mystery of the Incas. Yale University Press. ISBN 0300097638. ↑ Bingham, Hiram (1952). Lost City of the Incas. Weidenfeld & Nicolson. pp. 112–135. ISBN 9781842125854. ↑ Wright & Valencia Zegarra 2001, p. 1. ↑ Wright & Valencia Zegarra 2000. ↑ Bingham, Hiram (16 December 2010). Lost City of the Incas. Orion. ISBN 978-0-297-86533-9.